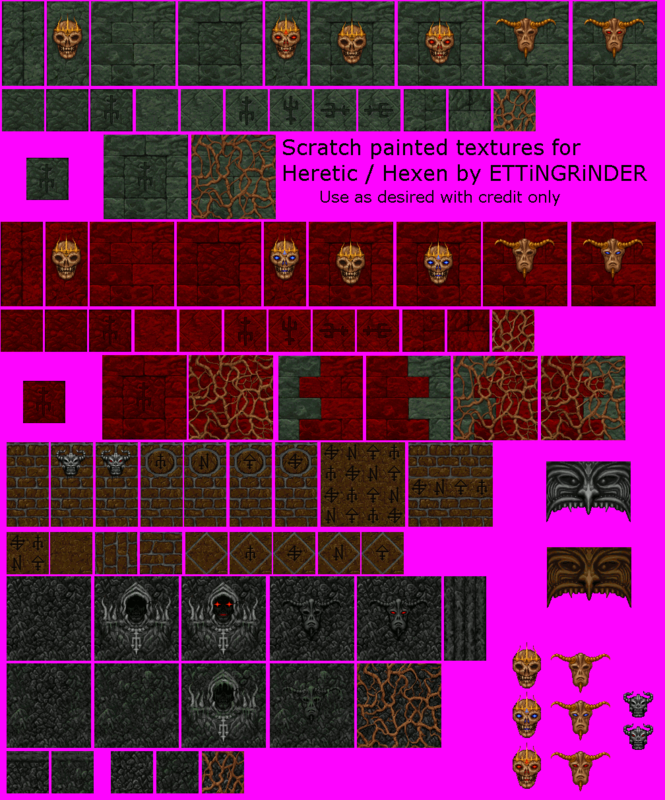 Here you can find textures and the like for designing Heretic and Hexen series mods. The stuff placed under this category is intended for free use, you do not need to contact me to ask about using it. 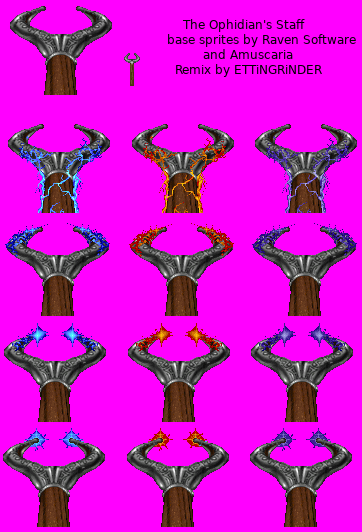 This is a collection of custom and edited textures for Heretic that I've been working on from time to time to use in my Heretic levels. 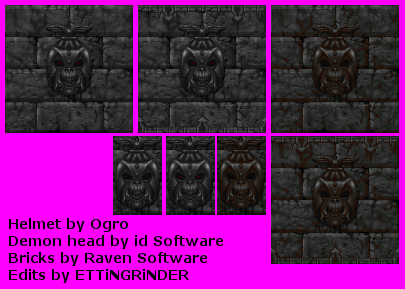 They are mostly edits of Raven Software's textures with a few originals as well as quality edits collected from other community resources; see the included text and information contained in the WAD for full credits. There should be no rips from other commercial games. The preview image is just a small taste of the pack, which includes over 350 graphic lumps. 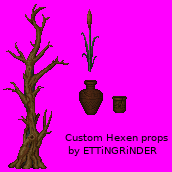 This is a collection of custom, edited and Hexen beta textures for Hexen that I've been working on from time to time to use in my "C.R.U.E.L." project for Hexen. 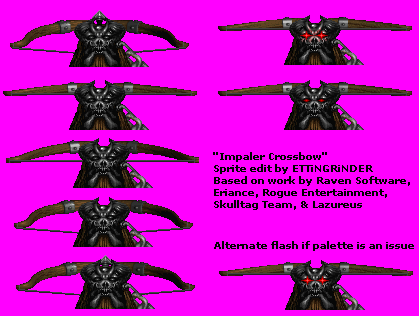 They are mostly edits of Raven Software's textures with a few originals as well as quality edits collected from other community resources; see the included text and information contained in the WAD for full credits. There should be no rips from other commercial games. The preview image is just a small taste of the pack, which includes over 300 graphic lumps. 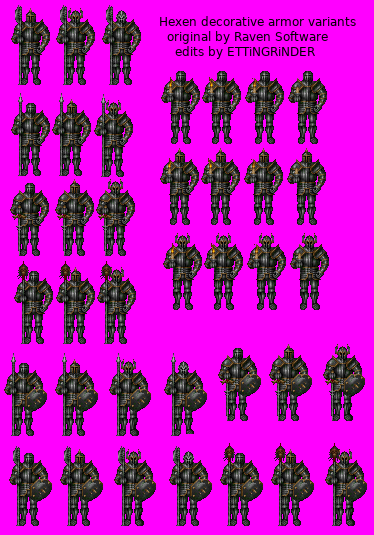 These are some sprites that I made from scratch while trying to make them fit Hexen's visual style. Most are old and might not be the best quality or take into account Doom-engine aspect ratios. The Chaos Sphere, as seen in the Hexen endgame. It's meant for the static holder and animated sphere to be combined. 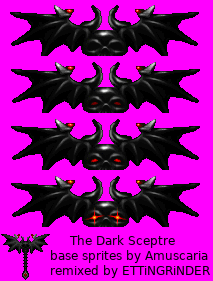 These were created by taking sprites from Hexen and altering/remixing them, and can be used for Hexen projects. 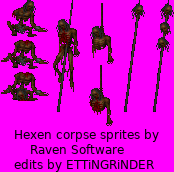 Edits of the various decaying corpse sprites. 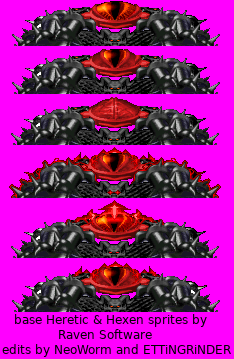 These are some old remixes based on weapon sprites by the outstanding Amuscaria. It's possible that some of them might not be very palette-friendly. These edits were remixed incorporating sources from multiple games; while problems are probably unlikely be aware that they could pose a copyright issue if used. They might also be paletted strangely depending on your intended purpose. 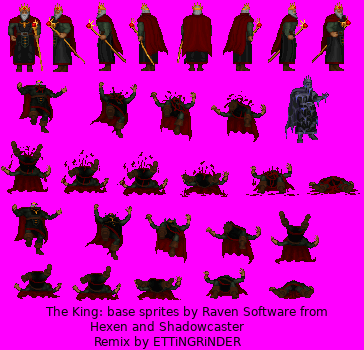 A really old sprite edit of a non-combatant NPC king with bloody and bloodless deaths.